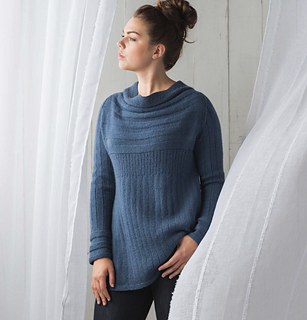 A raglan pullover designed to use different ribbed stitches to flatter a wide variety of figures. Stitches are cast on at the bust and worked in the round down for the body. Sleeves are cast on at the hem and worked circularly towards the shoulder. Bodice and upper arm stitches are joined and raglan decreases are worked. 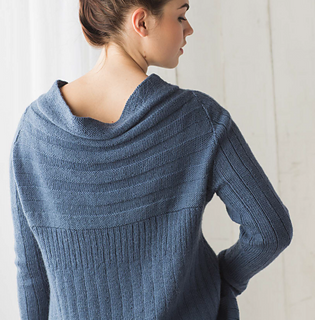 The sweater is completely seamless, and due to the nature of the stitches used, it is also reversible. It is meant to be worn with several inches of negative ease. This sweater was inspired by my months abroad in Australia. I was moved to create a sweater as comforting, simple and diverse as the people there, especially the amazing friends I made, whom I miss terribly. I hope this serves as a fitting homage to their welcoming kindness and friendship. 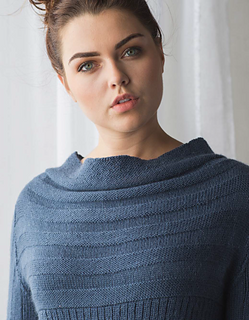 Blue version knit in Kelbourne Woolens Andorra appears in Wool Studio 101.